I never said he stole money. Changing the word that gets the emphasis, the meaning of the sentence changes. It can change six times. What did the person hearing it perceive? Perception is reality. Suppose the hearer was a reporter with a bias against whomever said it. How would it be reported? Before publishing their story, would the reporter have taken the time to investigate what happened to cause the subject to use the above six words? If you’re old enough to remember Watergate, you remember Ben Bradlee of the Washington Post would not publish anything Woodward and Bernstein wrote without two corroborating sources. Now, suppose you heard someone of importance use the above six words with NO emphasis on any particular one. And suppose you had a personal bias against the “he” who may have stolen. We all hear what we want or expect to hear. Those six words would delight our senses and confirm our suspicions. Can reality be relative to the perceptions of the hearer? Whom do you trust to tell you the truth? Recently I shared an item on Facebook from a friend. It was a link to a website and featured a headline expressing surprise that in light of what appears to be a popular tax cut, the opposing party announced plans to tout a tax increase in their efforts to gain influence in congress in the 2018 midterms. It quickly provoked a comment from a real life friend of mine questioning the source. I asked why that would be important if the information turned out to be true? Are we any closer to the truth? In court, it’s long been commonly accepted that eyewitness accounts are unreliable. When there are more than two, they seldom agree. Now, with the advances in video technology, is video tape trustworthy? I recently heard even the Zapruder film had been altered. Can we trust online fact checkers? My friends on the left like Snopes while my friends on the right prefer FactCheck. They both cite major funding sources as their reason not to trust. What about a situation in which someone you trust throws you a curve? An old friend sent out and email to his list of friends. I quickly identified it as a joke. It was masquerading as a newspaper article. Some recipients thought it was factual and replied with concerns for a professional who had supposedly been caught in a dalliance with a patient. He reports to his own amazement about half of the recipients thought it factual–despite the inherent absurdity. I’ve always appreciated the axiom that “perception is reality.” If how we perceive information is in fact what we interpret as truth, then whether or not something is in fact true, is like beauty. It’s in the eye of the beholder–no matter the source. We met with the lead doctor of the transplant team. One year ago today, my wife had exactly seventeen days to live. No one expected such a timeline. We received the news in February she needed a liver transplant. My attention was focused on how our lives would change and what it might be like after the surgery. I had made plans to retire so I could take care of her. It never occurred to me she wouldn’t make it to the surgery. Bob’s doctor admitted her to the hospital for fluids and tube feeding. Gastric problems had made it impossible for her to gain much needed weight to prepare for the transplant. A feeding tube would bypass the stomach and avoid problems.After four days, it appeared as though the plan was working. She had gained a few pounds and lab values looked good. X-rays to check on the placement of the feeding tube revealed the presence of double pneumonia. Monday, 4-27-15 at 4:37 P.M. Bob’s heart stopped beating. Seventeen days from today, family members will be in town to join me in observing the first anniversary of Bob’s death. It will be a special day for us all. Not because she died, but because she lived, our lives will never be the same again.What a blessing. In English literature class, we were taught a pun is a “play on words.” Officially, according to Merriam-Webster, it’s “the usually humorous use of a word in such a way as to suggest two or more of its meanings or the meaning of another word similar in sound.” The degree of humor varies with the listener. Often times, puns are greeted with groans and a roll of the eyes. In November 2009, the New York Times reported, “[Ruby Tuesday founder, Sandy Beall] was never much of a Rolling Stones fan; the name for his restaurant was suggested by one of several fraternity brothers who were co-investors.” Obviously, his frat brothers were fans of the Stones. I was (still am.) The first time I heard the name of the restaurant, the Stones’ song came to mind as fast as you can say, Jack Robinson. The photo above was taken by a Ruby Tuesday associate in the Orlando airport. I was returning home from a four day golf outing with Mickey Mouse et al. The trip was planned months ago as an element of my grief recovery. The loss of my spouse was devastating. The solo trip was healing. I studied the photo closely and have come to realize something I wasn’t conscious of during the shoot. Once the woman had agreed to take the photo and we had the setup arranged, I got into character. Notice my left heel is lifted a bit, my arm extended, my head tilted back a bit as though I’m straining to see someone in the crowd inside the restaurant. A slight blur in my fingers shows movement in the wave. The carry-on bag shows I’m traveling. In addition to the obvious pun, I’m waving goodbye to my past. A constant struggle for me in dealing with her death has been to live in the present while honoring many great memories. This photo proves to me I’m there. 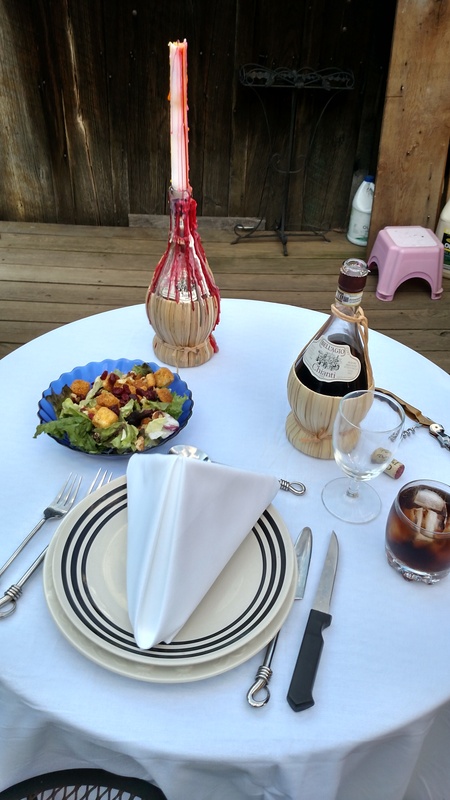 This night, I dined alfresco on the back deck. Dining alone has never been my first choice. In fact, if pressed to rank my preferences, it would come in dead last. 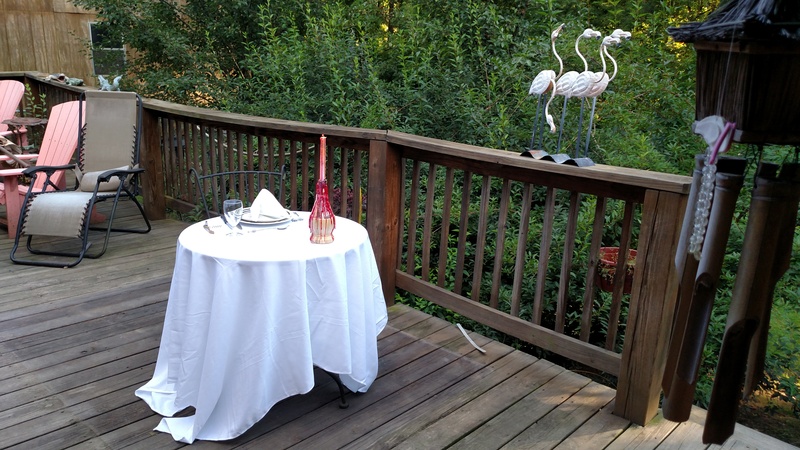 At some point in our lives, I suppose we’ve all had to endure a solitary dining experience. Over the last forty or so years, I’ve had my share of solo meals. During the last fifteen years, it was a rare occurrence. Now, it seems as though it is my destiny. Fate stepped in. Seems like that happens a lot to us mortal humans. I’ve always been the optimist. Not sure if it’s the result of genes or a learned behavior, but I have forever seen that proverbial glass as half full. My feet seem to always find the sunny side of the street and I accentuate the positive. It’s become a lifelong habit. In a twelve week span that included May, June, and most of July, my brother-in-law, John, and his wife, Veronica, taught me how to cook, plan meals, manage my refrigerator and freezer and gave me some tips on shopping. I now use my slow cooker and rice cooker regularly and freeze my leftovers for later meals. Veronica taught me the importance of an attractive presentation of a meal. That made sense to me. Get the visual appeal in tune with the aromas and flavors. Last week, I decided to prove to myself that I could do it and at the same time, assure my family and friends that I’ve learned a few things. Planning and shopping started the project. A white cotton table cloth and white “hotel” napkins came from Amazon. At the grocery story, I purchased a bag with nineteen different kinds of lettuce for my salad. Chopped walnuts and dried cranberries have always been a favorite in my salad and I found some Texas toast croutons in the cupboard. Add in the Marzetti Sweet & Sour dressing, and the salad was done. My favorite cut of beef is a rib eye steak. I prepared that on the grill while enjoying a cocktail of Wild Turkey and Coke. After I turned it the last time, I cut a few holes into it and filled them with blue cheese. Voila! 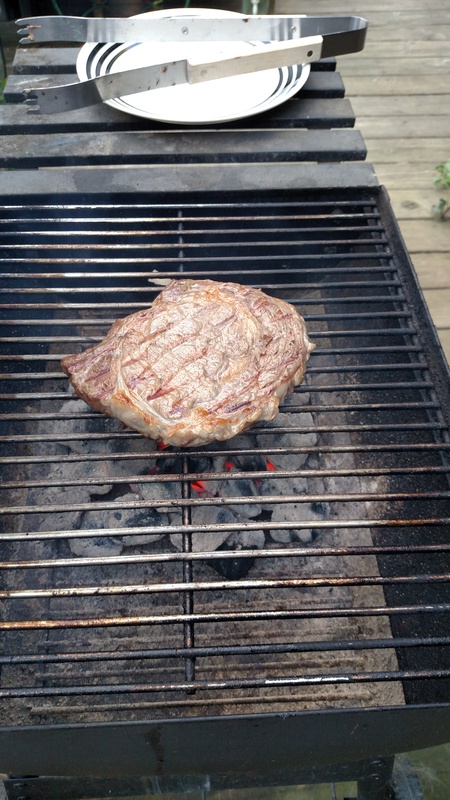 Black and blue rib eye. A can of corn warmed with real butter (it’s better for you than margarine) rounded out the main course. 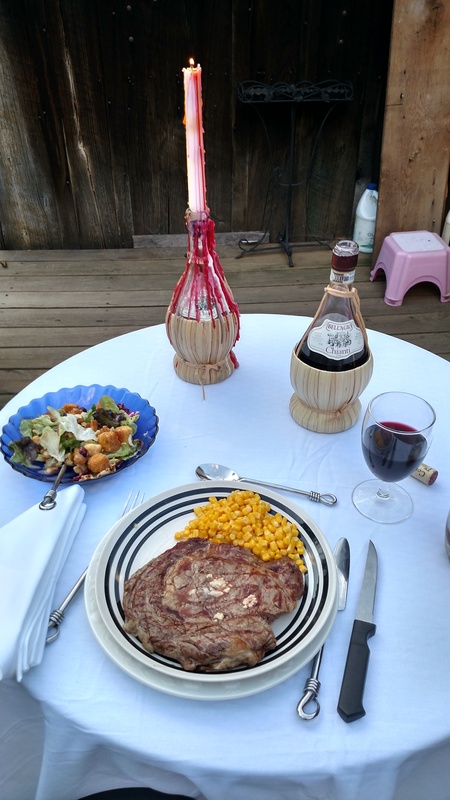 Complementing the steak dinner was a glass of Bell’Agio Chianti. 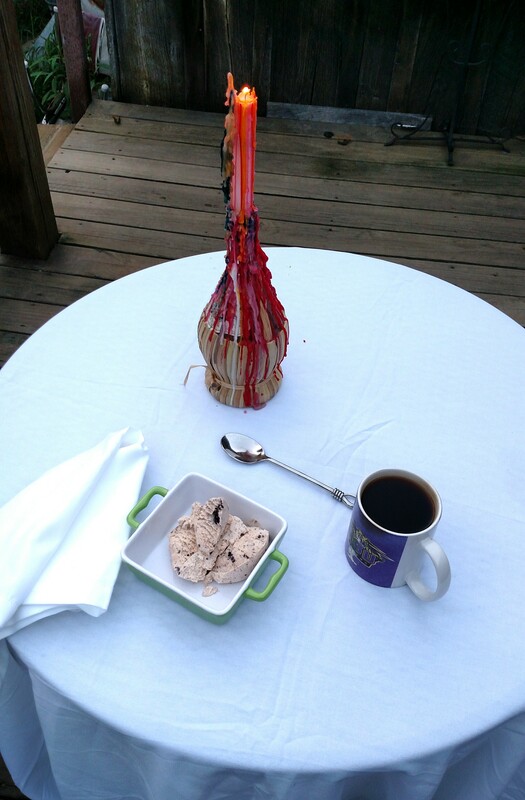 For dessert, I had vanilla ice cream with chopped up Oreos and a fresh cup of Community Coffee. 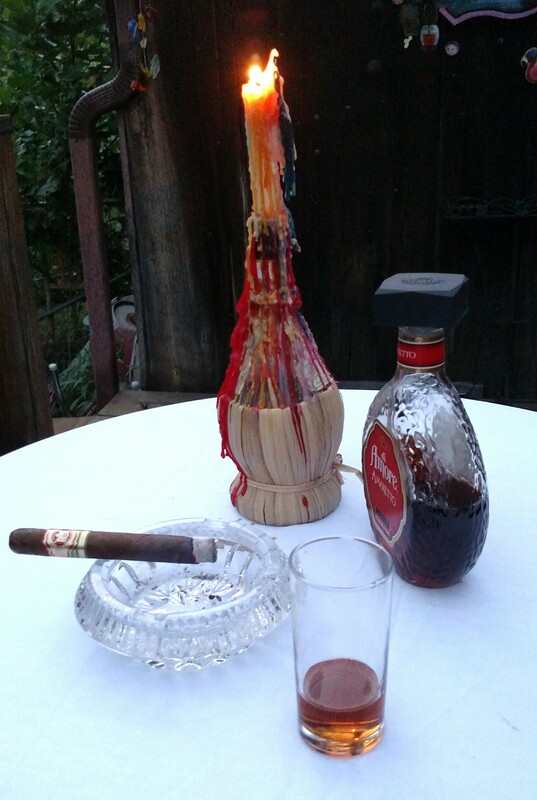 Finally, I finished off the evening with an after dinner drink (Amaretto) and a fine cigar (Arturo Fuente Flor Fina 8-5-8). Everything worked out well. While I was the only diner physically present, I’m certain I was not alone. I enjoyed it so much, I’ll definitely do it again. In fact, I’ve purchased a red and white checkered table cloth for the next time. The fare will be Italian—probably pork chops (instead of meatballs) and spaghetti. Dessert: vanilla ice cream with Oreo bits and Community Coffee. Some of my friends consider me to be an anachronism. In some ways, they’re correct. In many ways, I’m stuck in the sixties. Some of my mannerisms and behavior from the past have carried over into the new century. I don’t like the new age management jargon that has become prevalent in the last ten years. I prefer the old way of talking. It wasn’t concerned about being politically correct. Moving forward, reach out to me and we’ll dialogue about this and I’m sure you’ll be come a champion of the better way of talking with lots of takeaways from the entire blog, which can be found HERE. Join us here at Weekend Writing Warriors.The same link will take you to the work of dozens of talented writers. For a treat, please check out their work, too. participate in the Snippet Sunday group on FaceBook. Watch for a new chapter of my serial novel soon! Claudia Barry owned Manhattan’s West 33rd Street. She stayed close to the buildings, away from the crowds, aware of every face. Every movement got her attention. It was an old habit and hard to break. It had kept her alive. She took deliberate strides toward 8th Street. The drizzle had stopped, the skies were still overcast, and the sidewalk wet. It would have been impossible for her to miss the action fifty feet ahead of her. This week’s sample is the first eight sentences from A Year Without Killing (my third book.) 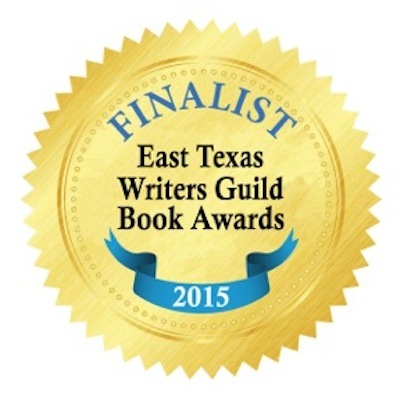 It recently was selected as a finalist in the East Texas Writers Guild’s First Chapter Book Awards. Each entry was judged by three different judges from a panel representing, editors, authors, educators, and avid book readers. An additional three judges were brought in to select winners from the finalists. 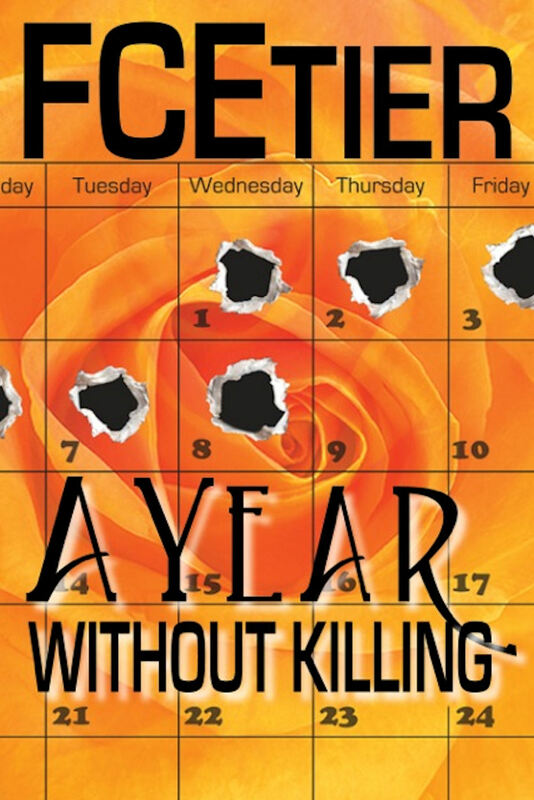 Read the entire first chapter of A Year Without Killing, HERE. Miss Bob’s cross stitch. It hangs on the wall in my studio, near where I’m typing this blog post. The television series, Twin Peaks, featured a memorable dream sequence in which a giant man appears to Special Agent Dale Cooper. In the dream, the giant says, among other things, “The owls are not what they seem.” My wife said that I was an owl, too, because I turned out to me something I didn’t seem to be originally (a friend who later became her husband.) 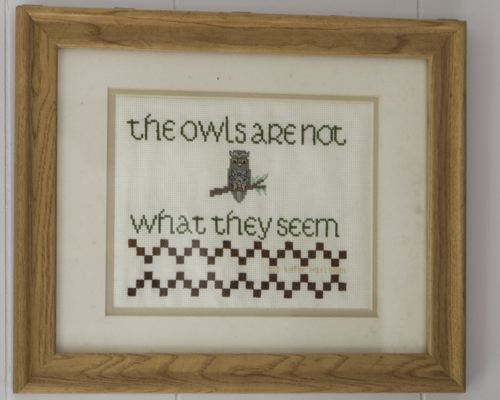 Eventually, we had a collection of owl memorabilia from cross stitch to various sized replicas. It was nice to be an owl for her. She had been a “Kat” and morphed into a flamingo. Maybe we were birds of a feather? We’re all animals anyway, but there are times in all of our lives when we seem to be something other than homo sapiens. Today’s sample comes from a blog that will post on Friday, the 31st on my publisher’s site. OK, it’s HERE. I was a “zebra” for sixteen years. 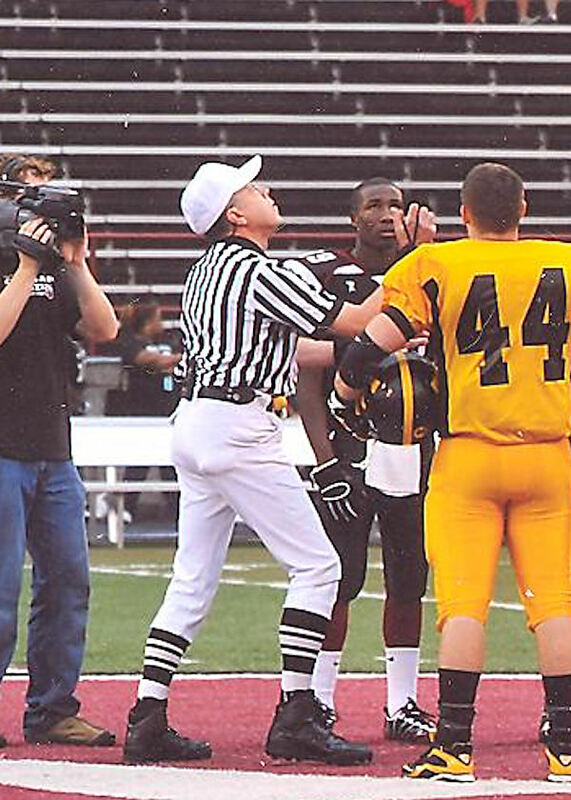 In this shot, I’m conducting a coin toss. Got a sample of your work?